Are You A "Risk-Wise" Advisor? Every investor psyche has a back story. I started managing money in 2000, right as the tech bubble was popping. My mentor started in the summer of 1987 just before “Black Monday.” Michael Carpenter, Journal of Financial Planning contributor, and author of, “The Risk-Wise Investor” started 3 weeks after the 1973 Oil Embargo. How’s that for timing the market? Experiences play a major role in shaping each advisor’s process for managing risk. Our advisors consistently tell us that Riskalyze makes the investment environment more understandable and actionable for them and their clients, giving them the tools to have an objective, defined and ultimately successful asset management process. We think part of the reason for that is how simple it is for advisors to incorporate their unique investment philosophies, biases and processes into Riskalyze. Riskalyze is agnostic on the choice of investment vehicles or approaches, whether an advisor prefers passive vs. active funds, rebalances each client when needed or automatically rebalances every account each quarter, or uses stop losses or moving averages to trigger allocations changes. Whatever the process, Riskalyze is versatile enough to help. But we do get a lot of questions from advisors looking to refine or improve their processes, and we were recently introduced to the work of Michael Carpenter, author of “The Risk-Wise InvestThis excellent book is an educational and actionable resource for any advisors looking to help their investors better understand and manage risk. The informational foundation, and the step-by-step, user-friendly “Risk-Wise” method presented in the book will serve any long term investor very well. Carpenter’s “Risk-Wise” process focuses first on understanding the true nature of risk (definition, perceptions, reality, risk physiology, behavioral finance, etc.,) and then on how to proactively apply that knowledge in managing almost any kind of risk (implementation and monitoring). Carpenter takes the reader through a purposeful discussion on risk with many fresh, new, impactful insights that can be immediately used with investors. From an advisor/client relationship standpoint, the importance he places on advisors and clients agreeing on an “empowering” definition of risk, coupled with common risk perceptions and realities, is extremely enlightening. As our Chief Investment Officer, I can say with confidence that Michael’s “Risk-Wise” process and Riskalyze’s technology compliment each other very well. In fact, Riskalyze helps address several of the core tenets of the “Risk-Wise” process, such as the completion of a personal risk assessment (hello Riskalyze Risk Questionnaire), evaluation of risk/reward tradeoffs (hello 95% probability range and Retirement Maps), and the review of risk reduction strategies (hello Risk / Reward Heatmap, stress tests, etc.). Advisors looking to improve their risk management process would be well served by investing in a copy of Michael’s book as a go-to resource. 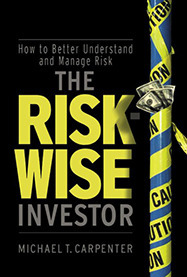 You can pick up a copy at his web site at www.RiskWiseInvestor.com.